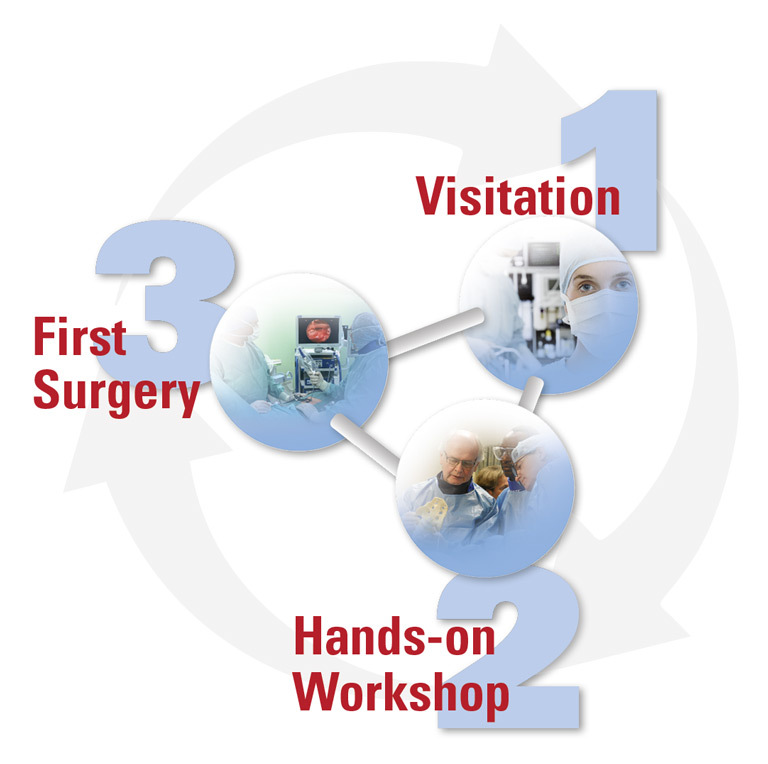 Dynamic 3-step-concept to learn the surgical techniques – education of the surgeon and the complete surgical team. joimax®, as a developer and provider of high-end instruments and devices for endoscopic spine surgery, emphasizes training and education for professionals to ensure medical performance of highest quality in the field of endoscopic spine procedures. Our comprehensive international medical education program aims at dedicated surgeons to start with endoscopic spine surgery, to then grow into becoming an expert or even a master. With the 3-step training program as part of the international medical education program, joimax® offers intense theoretical and practical education. During Step 1 the surgeon will become familiar with the surgical techniques while visiting at reference centers. Step 2 combines theoretical and practical training during joimax® workshops, and within Step 3 the newly acquired skills will be transferred and refined with our professional support during own first endoscopic procedures. “Exactly one year ago, I attended a Joimax basic course in Frankfurt. The course was great, the staff very supportive and I decided to adopt endoscopic surgery. During the year, I attender another course in Düsseldorf, visited the great Menno Iprenburg and three other excellent surgeons. Lat week, a brilliant surgeon vastly experienced in endoscopy came to Amman and together we did EIGHT fantastic cases. Thank you Dr Guntram Krzok. I learned so much from you, and will always be grateful. I am delighted to let you know that I started my cases of endoscopic surgery in Amman and already did a decompression and a disc case in my first week! I am absolutely confident that my team and I in Jordan will be offering this great technology to a huge number of patients from the whole of the middle east. joimax® aims at introducing most advanced Endoscopic Spine Surgery techniques to interested and ambitious professionals. Within our International Medical Education Program you can start as a beginner and become an Expert. Gaining initial experience during visitations, participating in joimax® workshops and performing your first surgeries will get you started on your way to becoming an experienced endoscopic spine surgeon. Attending additional user meetings, sucessfully using various joimax® systems in your daily routine and potentially becoming a joimax® Faculty will lead you to the Expert and Master Level in joimax® Endoscopic Spinal Surgery. Another important tool for education is the joimax® EndoTrainer Plus, which is used to train the TESSYS® or iLESSYS® surgical method. Under virtual conditions with a realistic haptic feedback the fluoroscopic controlled transforaminal or interlaminar access can be learned.